Ten years ago, the report of an Independent Panel of Inquiry into the impacts of Cerrejon Coal was published. Cerrejon is Latin America’s largest open cast coal mine, and is owned by Anglo American, BHP and Glencore, all now listed on the London Stock Exchange. Certain key recommendations of the Independent Panel of Inquiry remain unfulfilled. The evaluation below is written by Dr Aviva Chomsky, Salem State University, Massachusetts, USA. Further articles on Cerrejon Coal can be found at http://londonminingnetwork.org/?s=Cerrejon. In response, Cerrejón created an independent social review panel led by John Harker, president of Cape Breton University in Canada, along with Salomón Kalmánovitz, Dean of Economics and Business Administration at the Jorge Tadeo Lozano University in Colombia, Nick Killick, manager of UK NGO International Alert, and Elena Serrano of Casa de la Paz in Chile. The panel contracted with the Peru-based Social Capital Group to assess the company’s social practices. They have not. Despite repeated calls for the reconstruction of Tabaco—in the complaint before the OECD, in the Independent Panel report, and in the agreement signed by the company in 2008—the residents of Tabaco remain displaced as of August 2018. The community has not been reconstructed or relocated. We call upon Cerrejón Coal, its owners, BHP, Glencore, and Anglo-American, the OECD National Contact Points in Switzerland and Australia, the members of the Independent Panel, and in particular John Harker, who mediated the negotiations leading to the agreement signed between the Tabaco community and the company in 2008, to take action to finally, ten years too late, ensure the reconstruction of the displaced community of Tabaco. The Independent Panel noted that during Cerrejón’s tenure in La Guajira, “success in production was more marked than success in building trust, and one major factor was the previous approach to social management as being dominated by that which was permitted in law or prohibited by law. The panel respects the law, and would not advocate its being disregarded, but there is more to life than law, and legalism has its limits, which do not prove conducive to best practice. Social Responsibility is as much about ethics as law, and it must characterize Cerrejón.”(4) Unfortunately, Cerrejón continues to resort to legalisms to evade its moral, ethical, and legal responsibility for the relocation of Tabaco. The violent, forced displacement of Tabaco on August 9, 2001, was carried out under the cover of the law. A Colombian Supreme Court decision in May of 2002 denounced these events and ordered the reconstruction of the community by the municipality of Hatonuevo—thus once again giving a legal cover for the Company to refuse to make restitution to those it had violently dispossessed. Over and over, the company has evaded social responsibility by insisting on the letter rather than the spirit of the law, and refused to carry out what is clearly its moral and ethical, as well as legal, responsibility. The residents of Tabaco are the victims of this company stance. Based on the Independent Panel report, Cerrejón finally agreed to enter into negotiations with representatives of the displaced community of Tabaco. However, the accord that the parties signed in December of 2008 did not obligate Cerrejón to actually rebuild or resettle the Tabaco population. Instead, it reiterated the terms of the 2002 Supreme Court ruling that ordered the Municipality of Hatonuevo to carry out the actual reconstruction. Cerrejón’s obligations under the accord were limited to acquiring the land for the new settlement, “realizar las obras de adecuación de los lotes y trazado vial del predio,” and constructing a community center. (6) Nevertheless, the Tabaco community was filled with optimism that both Cerrejón and the Municipality had agreed, in principle, on the reconstruction of their community. The optimism proved premature. First, the company’s acquisition of the property known as La Cruz was repeatedly delayed. When the mine finally purchased the property and turned it over to the municipality in 2011, the Municipality lacked the resources to fulfill its obligation to actually rebuild the infrastructure and houses for the community. 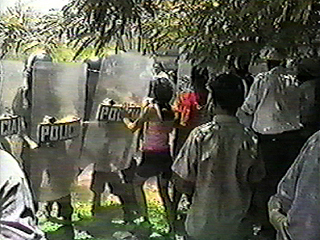 Seventeen years after its violent displacement, sixteen years after the original Supreme Court decision, eleven years after the complaint filed before the OECD, and ten years after the Independent Panel Report and the Convenio de Cooperación signed by Cerrejón, the Municipio of Hatonuevo, and the Tabaco Relocation Committee, the people of Tabaco remain dispossessed, the reconstruction of their community a distant dream. Cerrejón continues to insist that by purchasing the land and agreeing to build the Community Center, its responsibility for the resettlement of Tabaco has been fulfilled. Yet the Independent Panel report explicitly argued that adherence to the minimum required by law is not equivalent to social responsibility, and that in order to remedy the multitude of harms and distrust the company has created in La Guajira, the company must first and foremost acknowledge its responsibility for the destruction of Tabaco, and carry out a just resettlement. The Independent Panel looked beyond Tabaco and recognized the impact and harms caused by the company in the communities of Roche, Chancleta, Patilla, Tamaquito, and others. “It cannot be denied,” panelists concluded, “that some communities have found it difficult to maintain past activities or develop new ones during the time in which Cerrejon has been in operation.” These problems continue to plague the communities, despite the Panel’s recommendation that Cerrejón “do more to contribute to a better life for people in affected communities” and “effectively address the communities’ concerns.” The Company, the Panel insisted, must live up to “the spirit” as well as the minimum requirements of international standards in its resettlements. (7) Once again, the Panel emphasized the urgent need for an approach that assumes responsibility, rather than using legalisms to evade responsibility. We call upon Cerrejón to abide by the recommendations of the panel and to live up to the slogan announced by its president León Teicher in 2006: “No hacemos lo mínimo necesario, hacemos lo máximo posible.”(8) The company must assume full responsibility for a just and comprehensive resettlement of the community of Tabaco, and justice for the other communities affected and displaced by the company’s operation. We call upon BHP, Glencore, and Anglo American to ensure that Cerrejón carries out this process immediately. We call upon the members of the Independent Panel and the OECD National Contact Points in Australia and Switzerland to acknowledge that the issues relating to Tabaco and other communities have not been satisfactorily resolved and that immediate action is necessary to remedy this situation. 1  “Final Statement by Australian National Contact Point for the OECD Guidelines for Multinational Enterprises: BHP-Billiton – CERREJÓN COAL,” in OECD, OECD Guidelines for Multinational Enterprises, 2009, 26-30. https://books.google.com/books?isbn=9264091394. 2  “Cerrejon Coal and Social Responsibility: An Independent Review of Impacts and Intent,” February 2008. https://www.cerrejon.com/wp-content/uploads/tpr-en/February2008/FinalPanelReportFebruary-min.pdf. 3  “Final Statement,” p. 29. 4 “Cerrejón Coal and Social Responsibility,” p. 47. 5 “Cerrejón Coal and Social Responsibility,” p. 4. 6  “Convenio de Cooperación celebrado entre el Municipio de Hatonuevo, La Junta Social Pro-Reubicación de Tabaco y Carbones del Cerrejón, Limited, para le ejecución de los Acuerdos de la Comunidad de Tabaco,” December 2008. https://www.cerrejon.com/wp-content/uploads/tpr-en/December2008/Seethefinalagreement-min.pdf. 7  Cerrejón Coal and Social Responsability,” p. 6, 25.